What do I feed my pet rats? What foods should I avoid feeding them? Most people choose to feed a block food as it is the most simple. See the Lab Block tab. 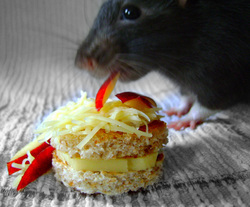 As rats are omnivores, they eat nearly everything that humans do. Feel free to offer a small amount of whatever food you have prepared for yourself (with some noted exceptions) but remember to watch portion sizes. Also, junk food is as bad for rats as it is for us. What should your rats eat besides lab block, if you choose to feed that? See the Other Foods tab. What foods might hurt your rats? See the Unsafe Foods tab. All pages include a link to the diet page on The Rat Fan Club, where you can get additional information about feeding your rats. A non-lab block option is also discussed.